Contrary to historical times, when the bathroom was purely utilitarian, the modern bathroom has actually become somewhat of a sanctuary within the home. It’s a place that can be used to relax after a long day and to escape from the world for some well-deserved personal time. More and more bathrooms these days take design cues from luxury spas to further amplify the relaxing ambience and create a warm and cosy atmosphere. Creating a spa-like atmosphere in your bathroom doesn’t need to be an expensive operation. Rather than opting for a full scale renovation, the simple addition of some decorative pieces and some effort in creating colour schemes and choosing the right materials can do wonders for your existing bathroom. Here’s how you can bring the spa atmosphere into your home. Wooden textures and accessories provide a feeling of warmth, and making use of wooden accents can add an immediate touch of luxury to any bathroom. Wall mounted slats, accessories, and benches are all great ways to bring wood into your bathroom. The colour palette chosen for your bathroom can have a profound effect on its ambience. Using luxurious and calming colours like beige, brown, and light grey can transform your bathroom from the traditional white utilitarian space into a spa-like sanctuary. Lighting is everything when it comes to setting mood. Making good use of dim lighting, with soft bulbs and warm hues, is a great way to immediately transform your bathroom into a relaxing space. Consider using lamps rather than your primary ceiling light, but remember to keep them in a safe location and well away from water. A simple yet truly functional piece, the bathroom caddy can completely change your bath experience. Repurposing some recycled wood is a great way to create a caddy, and will give you the option of resting a glass of wine or a good book while you bathe. This one simple addition can have a significant impact on how much you enjoy your baths! Shelving is key in spas as it reduces clutter and provides a classy way of displaying things. Adding shelves to your bathroom can take it a step further into spa territory, while providing additional function. Wooden shelves are an excellent choice if you’re looking to maintain an earthy feel. Candles are the quintessential ambience improver. Some well-placed tea lights or scented candles will negate the need for formal lighting and provide you with a much more relaxing environment to while away the stresses of the day. Ensure they are positioned in a safe place to avoid any fire hazards. Bath salts add an element of occasion to a routine bath, and are also excellent for your general health and wellbeing. Whether you purchase some salts or make them at home yourself, this is an easy way to add a touch of luxury just as a spa would do. If your bathroom is tiled, purchasing some overlay decking can do wonders for the general decor and ambience of the room. Consider using a small piece as a bath mat, or go the full route and lay it over your entire bathroom floor. The difference will be amazing. Spas use natural hues and elements from nature to create an environment of relaxation and total serenity. Consider introducing your own natural elements such as small green plants, pebbles, and wood. Bringing the outdoors in is the easiest way to get back to nature. Professional day spas have the most luxurious towels, adding to the whole experience of comfort and relaxation. There’s no reason why you can’t invest in some high quality linens and towels at home to add a touch of luxury to your bathroom. Their aesthetics and feel will transport you to a spa, right in your own home. General products and amenities such as soaps, shampoos, and accessories like toothbrush holders can also introduce a touch of luxury into your bathroom. Investing in high grade products will make an immediate difference both physically and psychologically. Even if you only use them on special occasions, they’re a worthwhile investment. Incorporating some relaxing artwork can help transform your bathroom space and make it considerably more inviting. Consider installing something that relaxes you while you relaxing the bathtub. Pay particular attention to the scene and colours used in the artwork and keep them within the relaxing palette. In addition to shelving, specific organisational accessories such as baskets can help you to keep clutter at bay. A cluttered bathroom will result in a cluttered mind, and removing this will bring your bathroom one step closer to being a spa, allowing you to truly relax and focus only on yourself. Smart storage is a valuable investment for any bathroom. 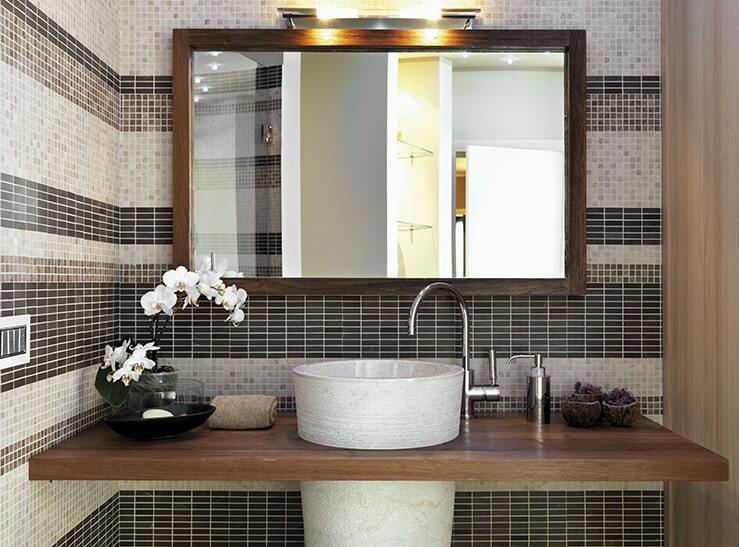 Simply putting in some effort into your existing bathroom can transform the atmosphere entirely. These cost-effective tips are worth experimenting with in order to craft the ultimate bathroom environment; and if it isn’t already, your bathroom may very well become your favourite room in the house.